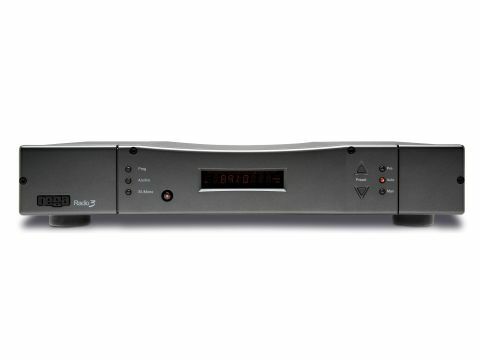 The Radio 3 is one of the most competitively priced tuners from any of the UK hi-fi specialists. Externally, it's absolutely Rega - the design and construction being quite distinct from anything made by other brands. Unless you've a passion against plastic front panels, it's eye-catching and practical. The minimalist control make the unit slightly trickier to use than some, but one can soon learn to live with that. At the rear is the minimum number of connectors for aerials and audio - none of your fancy remote control connections or USB here! All the money has gone inside the case, where one finds a tuner head from Kwang Sung (who seems to have nearly monopolised the market for such things, replacing the familiar names of old, Alps and Mitsui) followed by three wellestablished chips from Sanyo that do most of the decoding work. The output buffers use discrete transistors, while the power supply is based on a small toroidal transformer. Passive components throughout the unit are of good commercial quality and the general theme is clearly thoughtful design of circuitry for performance to a budget. Tuning is in half-step increments (25kHz) and there are the usual automatic scan-tuning and presets to speed things up, but no RDS, and no signal strength indicator either. Even the remote control is an optional extra - since it controls a complete Rega system, many purchasers will presumably have one already. What this tuner lacks in features it comfortably makes up for in performance. In a group extending to over twice its price, it shouldn't be the outright best and it isn't, but in terms of value it's as attractive as any. Just as on the last occasion we heard it, we continue to be impressed by its natural and extended bass - ultimately it's not quite as solid as that of the Cyrus but it is certainly more than passable, with real presence and a convincing way of following low-lying melodic lines and percussion alike. In the midrange, there isn't quite the transparency that the very best in FM tuners can offer, but there is a commendable level of detail. There's also mild coloration that affects the high midrange, just slightly adding a bloom to high-lying melody instruments. It's not unpleasant, but if one's being really picky it isn't quite accurate. Above it, however, the real treble has a nice relaxed quality to it which is just occasionally compromised by a hint of 'boxiness', closing in slightly on high harmonics and their decay into ambience. If this sounds like pretty picky criticism for a tuner, that's a fair point. Overall, we were impressed by the musical and communicative qualities of the Radio 3. It is not fussy about musical styles and indeed handles spoken voice just as confidently and such sins as it possesses are minor ones mostly of omission rather than commission - it hasn't quite the authority of real high-end wireless nor the purity of treble, but it adds little signature of its own and strongly resists obvious distortion. In almost every area, measured performance of the Radio 3 is middling to good. Distortion particularly is better than many, but not as good as some, with a marked increase when only one audio channel is transmitted. Noise is about par for the course, too, but what may be significant is that it has a distinct 'colour' compared with the group average, with a slightly lower level in the psychoacoustically significant band from 2kHz to 5kHz but a minor lift above 6kHz. Differences are slight, not much more than 1dB, but it's probably not fanciful to relate this to the slightly closed-in treble. Pilot suppression is good and the intermodulation artefacts in the band above 15kHz are kept to a remarkably low level, which can only help keep the sound clean as they represent highly unnatural, anharmonic distortion which tends to be very unpleasant. As with all the tuners in this group, distortion basically vanishes into noise for levels below -20dB.